The Holy Celtic Church International offers women called to assist the clergy with pastoral ministry the opportunity to become deaconesses. Just as clerics and particularly priests and bishops act in persona Christi at the altar, deaconesses act in persona Mariae, as a channel for Our Lady's wisdom and compassion in the world. A deaconess is not a deacon who happens to be female, but rather is one of a unique and ancient order for women which has always stood alone and distinct from the clergy, having a different and complimentary charism and responsibilities. A deaconess may preach, teach, read the Gospel in Church, distribute Holy Communion and assist with the baptism and unction of women and children. In extraordinary cases of necessity she may also be given faculties to baptise and preside at non-sacramental civil marriages and funerals. As with the clergy, deaconesses are bound to recite the daily office, morning and evening, and each deaconess may be supplied with the Blessed Sacrament for Holy Communion and Eucharistic Adoration. Women interested in becoming deaconesses in the Holy Celtic Church are invited to use the contact form on the St Gall's Seminary page. Please see the (shorter) Rite of Admission below. There is also a longer form of admission and five short services of admission (parallel to the Minor Orders for Clerics) may be given, preparatory to Admission as a Deaconess, if convenient and so desired. The official habit of deaconesses in the HCCI is a blue or violet cassock and white veil or mantilla unless the deaconess is also a nun, in which case she wears the habit of her order. She also wears a pectoral cross as a symbol of her office. Members of the Deaconess Society of Our Lady and St Ita are invited to join the Confraternity of the Life of Mary as a support to their spiritual life and ministry. The Secondary Patroness of our Deaconess Society is St Ita, Ab. The office of deaconess (from the Greek diakonissa – a female servant) has been established as a lay office devoted to work for Our Lady, to which suitably qualified and mature women may be admitted at the discretion of the Ordinary. The duties of a deaconess include work with children, with church guilds, with choirs, the visiting of the sick and the infirm and other work authorized in the name of Our Lady. The office of deaconess, like any other lay-office in the Church, is entirely separate from Holy Orders. The bishop stands at the foot of the altar steps, the standing before him. Bishop: In the name of the Father + and of the Son and of the Holy Spirit. R/.Amen. C. The office of deaconess has been established in the church to further the work of the holy Lady Mary, our heavenly Mother. She, as the earthly mother of Jesus has ever been regarded by the church as the pattern of humility and purity, of love and compassion, the very spirit of motherhood. As the Lord Christ fulfils his ministry to humankind through bishops, priests and deacons, aided by the holy angels, so the holy Lady Mary, works through mothers, nurses and dedicated helpers in many fields, with her holy angels, of whom she is the queen, in her ministry as divine mother of the world. Since after due deliberation and mature consideration you have responded to Our Lady's call and are now to be admitted to the office of deaconess in Christ's holy church, let me exhort you to be mindful of the duties of your office. It will be your privilege to aid in the work of the holy Lady Mary, our heavenly mother, by service to children, mothers, the helpless, the aged and the sick. May your heart be filled with love for God and with gentle sympathy and understanding for all his children. In whatever service you may be called upon to perform, may the purity and tenderness of the holy Lady Mary show forth in your words and your actions, so that by your example you may quicken such virtues in the hearts of others. Will you strive earnestly to fulfil the office now about to be entrusted to you? P. The Lord keep you in all these things and strengthen you in all goodness. R./Amen. The candidate kneels before the Bishop. P. Almighty God, we pray thee to fill the heart of this thy daughter with the spirit of the love and compassion of the holy Lady Mary for the faithful performance of her office. May thy love ever show forth in her actions and may she ever be resolute and steadfast in thy service. R/.Amen. May the blessing of God Almighty, the Father, + the Son and the Holy Spirit, come down upon thee, that thou mayest rightly fulfil that which today thou hast undertaken. 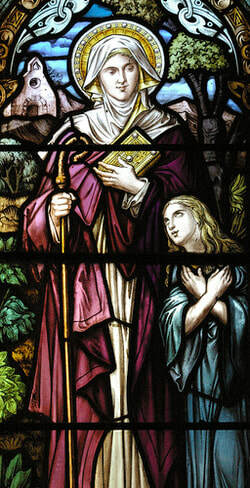 "After St. Brigid, St. Ita is the most famous woman saint in Ireland. Her birth of noble Christian parents, Kennfoelad, a Déise Chieftain and Necta his princess wife, is said to have taken place around 470 near Faithlegg outside Waterford. From her baptism on she was filled with the Holy Spirit. All marvelled at her childhood purity and behaviour, and her abstinence on the days she had to fast. She was prudent, very generous, kind toward everyone, and gentle as well as chaste in her language. As she grew up, it quickly became apparent that she wished to devote her life to God. There is no doubt Ita excelled in the ‘Six Gifts" of Irish womanhood the ancient Celt looked for in the well educated girl - wisdom, purity, beauty, music, sweet speech, embroidery. She refused an offer of marriage as she wanted to consecrate herself completely to Christ. Her father refused her. She went at once to an aged priest she had known from childhood and publicly made her vows which she had already formed in her heart. She left her father’s house and the pleasant places round it and set out with some companions for the Ua Conaill territory in the West of Munster, the present Co. Limerick, to a place called "Cluain Creadhail" which some interpret to mean "Meadow of Faith" and which is now called Kileedy. Legend has it that Ita was lead to Killeedy by three heavenly lights. The first was at the top of the Galtee mountains, the second on the Mullaghareirk mountains and the third at Cluain Creadhail. Her sister Fiona also went to Killeedy with her and became a member of the community. Also known as the Brigid of Munster, biographers often compare St. Ita to St. Brigid, but the differences are more striking than the resemblances between these two foremost women saints of the Catholic church. Brigid's life was spent in continual movement. When she had made a success of one convent settlement, she moved off to found another. Ita did just the opposite. Instead of entering one of Brigid's convents, she founded a convent in a district where there was none, at the foot of Sliabh Luachra. The place became known as Killeedy and it was here that she remained until she died. A strongly individualistic character is glimpsed in the stories that surround her life. When she decided to settle in Killeedy, a chieftain offered her a large grant of land to support the convent. But Ita would accept only four acres, which she cultivated intensively. The convent became known as a training school for little boys, many of whom later became famous churchmen. One of these was St. Brendan, whom Bishop Saint Erc gave to Ita in fosterage when he was a year old. St. Ita kept him until he was six. The great Navigator revisited her between his voyages and always deferred to her counsel. He once asked her what were the three things which God most detested, and she replied: 'A scowling face, obstinacy in wrong-doing, and too great a confidence in the power of money'. Brendan also asked her what three things God especially loved. She replied, "True faith in God with a pure heart, a simple life with a religious spirit, and open-handedness inspired by charity." 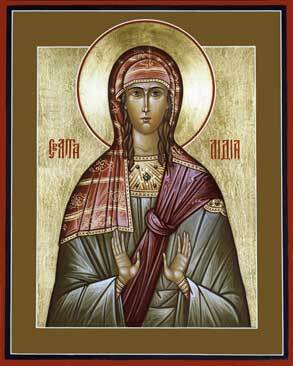 Ita's original name, some claim, was Déirdre, but because of her thirst for holiness she became known as Ita. This quality may have been what drew so many women to join her monastery and families to send their sons to her. Besides her mentoring, Ita is also associated with competence in healing, and an Irish lullaby for the Infant Jesus is attributed to her. As with other monastic figures of Ireland, she spent much time in solitude, praying and fasting, and the rest of the time in service to those seeking her assistance and advice. St. Ita died in approximately 570. Her grave, frequently decorated with flowers, is in the ruins of Cill Ide, a Romanesque church at Killeedy where her monastery once stood. A holy well nearby, almost invisible now, was known for centuries for curing smallpox in children and other diseases as well. This well has two names - It is called St. Bernard’s Well on the OS map, but the local name has always been Tobar Bhaile Ui MhÈidÌn, My Little Ita’s Well, coming from the place name, Cill Barra MhÈidÌn. "Church of my little Ita’s Height." There is a strong local following of St. Ita in Munster, particularly in Waterford and Limerick, and her name is a popular one for Irish girls. In the middle of the nineteenth century, a new move was made in Ireland for recognition of her importance in the Catholic church; this was accomplished when Bishop Butler of Limerick obtained from Pope Pius IX a special office and mass for her feast which is now kept on January 15."